We are happy to arrange a Pottery Party for anyone but to give you an idea we have split the examples into three sections below. Please have a look and if you would like something a little different from one of the regular parties let us know and we will do our best to meet your requirements. The main aim of the party is to have a good time but also for each child to end up with something that they will be proud of. During the party each child will have a go on the potters’ wheel. While this is going on the rest of the party is making things by hand. At the end of the party they will have at least three pots each. The cost of the party is £85. This includes the first four children with additional children costing £8.50 per head. You can choose to take pots home on the day or have them fired. Pots taken home on the day are £1.25 each while pots that are fired are £3 each. The firing process takes three to four weeks and we will call you when the work is ready for collection. The length of the party depends on the number of children but from one and a half hours. There is an option of having a bag of clay and instructions for making an animal to take home at £2.50 each (a discount of £1). The maximum number we can cater for is 30. We have a grassed area suitable (in good weather) for picnics. A room for party food is also available at £15 per half hour. If you would like further information please let me know. You are welcome to visit the pottery and we will show you what and where it happens. For children age 7 or under a “Play with Clay” Party is most suitable. Instead of a formal party, where pottery is taught, at this party you can paint pottery and make clay animals at your own pace. Plus everything is taken home on the day. Prices start from £9.50 per head for making a clay animal and painting a piece of pottery. Adult party half a day visit. This is especially suitable for smaller groups. During the party each person will have a go on the potters’ wheel. While this is going on the rest of the party is making things by hand. At the end of the party they will have at least three pots each. The price includes all materials used on the day. There is a minor charge for firing the pots. They can then be picked up or posted on to you. You are welcome to bring a drink and nibbles/cake. Adult party Full Day Visit. Throwing on the potter’s wheel and making pots by hand. Demonstrations are given before each activity. The price includes all materials used on the day. There is a minor charge for firing the pots. They can then be picked up or posted on to you. There are local canalside pubs and restaurants available for meals. You are welcome to bring a drink and nibbles/cake. This is an ancient Japanese way of firing pots. The day is spent glazing and firing pots in the traditional manner. There is a fair amount of smoke, flame and steam and therfore this takes place outside in the warmer weather. The price includes all materials used on the day and also your Raku pots to take home. There are local canalside pubs and restaurants available for meals.Price per head = £85. There is a minimum charge of 6 for all events. 1. Short visit. This is especially suitable for smaller groups. During the party each person will have a go on the potters’ wheel. While this is going on the rest of the party is making things by hand. At the end of the party they will have at least three pots each. The price includes refreshments – tea/coffee, workshop time, tools and all materials used on the day. There is a minor charge for firing the pots. Which can then be picked up or posted on to you. There are local canalside pubs and restaurants available for meals. 2. Full Visit. Throwing on the potter’s wheel and making pots by hand. A potter will demonstrate various methods. The price includes all materials used on the day. There is a minor charge for firing the pots. They can then be picked up or posted on to you. There are local canalside pubs and restaurants available for meals. 3. Raku Kiln Firing Day. This is an ancient Japanese way of firing pots. 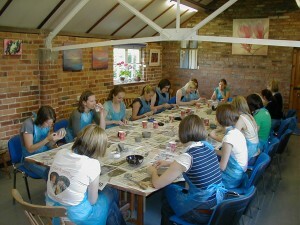 You will spend the day glazing and firing pots in the traditional manner. This done outside as there is a fair amount of smoke, flame and steam. This takes place in the warmer weather. The price includes all materials used on the day and also your Raku pots to take home. There are local canalside pubs and restaurants available for meals. Price per head = £85.